Employers play an important role in educating and assisting commuters in discovering the best commute mode for their employees. Individuals with long commutes find vanpooling one of the best commute options and enrolling in the Metro Vanpool Program provides a valued benefit commuters appreciate. The Metro Vanpool Program has created this guide to inform and assist employer representatives about the program and best practices to achieve the best results for all Metro Vanpoolers. Vanpool commuting can help your company’s bottom line by reducing parking demand and improving your ability to recruit and retain qualified employees. The Metro Vanpool Program makes this commute option even more attractive and economical. The Metro Vanpool Program provides public funds as a lease fare subsidy to all enrolled Volunteer Participants who act on behalf of all the passengers in their vanpool. Metro’s first point of contact will always be the enrolled Volunteer Participant and Metro maintains a one to one relationship with them. Employer representatives may engage with the Metro Vanpool Program by receiving important updates containing necessary items for the vanpool to remain in the program. This guide will explain how to apply to be in the Metro Vanpool Program and maintain enrollment. We also detail the roles and responsibilities of employers and the programs benefits. At the end of this guide we offer answers to frequently asked questions and a list of defined terms. Use the table of contents below to jump to the section you need. Should a vanpool Applicant or enrolled Volunteer Participant need to reach staff please direct them to the Metro Vanpool Program Help Desk at vanpool@metro.net or 213.922.7003. Employer representatives with general questions about the Metro Vanpool Program may reach us by calling 213.922.6226. To start a vanpool, at least five people who share similar commutes and times will want to speak with Metro and our Vehicle Suppliers. The Vehicle Suppliers will provide vehicle and lease options. When the vanpool is ready, the Vehicle Supplier will inform Metro Vanpool Program staff that the vanpool group would like to apply. The Volunteer Participant for the vanpool will work with Metro, their Vehicle Supplier, and their employer to complete the application. The employer can be of assistance by educating the group of any subsidies, programs or parking benefits and help source additional riders if needed. Please review the Participating Vanpools page to familiarize yourself with the duties of all enrolled Volunteer Participants. Keep in mind, Metro engages with Applicants directly. Applicants will need to receive and reply to emails from Metro. Employers are encouraged to empower applicants to communicate directly with Metro staff regarding application details. This will set the stage for their responsibilities as the enrolled Volunteer Participant. Please also review the information on our Applicants page. Employers can contact the Metro Vanpool Program to learn more about the program or receive assistance in developing new vanpools. Contact the Metro Vanpool Program Marketing Representative at 213.922.6226. If one of your employees applies to participate in the Metro Vanpool Program and their application is accepted, they become an enrolled Volunteer Participant. So long as the Volunteer Participant continues to meet the terms of our Agreement, follow our Guidelines, and adhere to our Policies, their enrollment will continue. Read. Encourage your employees to read all our communications carefully. Please also encourage them to bookmark our Participating Vanpools page: metro.net/vanpoolforms. It is full of information that will help them maintain their enrollment. Respond. When we reach out to applicants and Volunteer Participants it is usually because we need something and it may be urgent. Successful Volunteer Participants reply to Metro Vanpool Program requests quickly. Empower. Successful employers recognize that Metro maintains a one to one relationship with the Volunteer Participants and give their employees the tools, information, and help they need to maintain program enrollment. 3) maintain their contact information, schedule/route details, and passenger list by submitting a Vanpool Update form each time something changes. Each of these items is discussed further in the subsections below. All enrolled Volunteer Participants will need to submit a Monthly Vanpool Report each month they are enrolled. As the employer representative you can assist any Volunteer Participants at your organization by providing them the information they need to complete their reports. For example, if your organization provides fuel for the vanpools, you can make sure that your enrolled Volunteer Participants know the total cost of gas for their vanpool. Please visit and read our complete Monthly Vanpool Report Policy page. Please review our sample Monthly Vanpool Report as you review our tips below. Metro requires actual and precise data. We cannot accept forecasts, estimates, predictions, or approximations. Volunteer Participants are responsible for completing the correct form, format and data when submitting documents to Metro. Instruct Volunteer Participants at your organization to respond to all Metro Vanpool Program communications they receive. Employers can assist Volunteer Participants by providing printers and scanners for preparing the signed Monthly Vanpool Reports. For those Volunteer Participants that lack computer access as part of their regular workday, Employers can set up a space with a computer so that Volunteer Participants can submit documents to Metro. If a Volunteer Participant fails to submit a complete and valid Monthly Vanpool Report they will lose their subsidy for at least three months. See this page for more details. Please review our complete Monthly Vanpool Reports Policy for more information and details about submitting a complete and valid Monthly Vanpool Report. Metro is required to conduct random audits. The selected Volunteer Participants will receive their Audit form at their mailing address. Metro mails the Audits about a week before the assigned date. Should a Volunteer Participant have a question about the Audit, please direct them to the Help Desk at vanpool@metro.net or 213.922.7003. Please also visit our Audit section on frequently asked questions page. Please review our sample Audit as you review our tips below. Completing and submitting the Audit is requirement of the Metro Vanpool Program. Failure to conduct and submit an Audit may lead to the termination of the agreement and lease fare subsidy. The Vanpool Update form is submitted when the Volunteer Participant has changes to their personal information, route, schedule, or passengers. Volunteer Participants should take care to keep their contact information up to date. Any changes to phone numbers, email address, or mailing address will need a completed Vanpool Update form and should be submitted as soon as possible. For example, if a Volunteer Participant submits an incomplete Monthly Vanpool Report and their email address is out of date, we cannot contact them for a correction. Please review our sample Vanpool Update form as you review our tips. Start/pick-up locations are the places where you pick up passengers to start their trip to work. Examples, a home, a shopping center, or a park-and-ride lot. Work/drop-off locations are the places where you drop off passengers at work. Examples, an office building or a worksite. If a Volunteer Participant needs their current passenger list, they may email us at vanpool@metro.net with their name and Vehicle Number and we will send them their current passenger list. In the section below we explain the roles and responsibilities of our enrolled Volunteer Participants and employer representatives. The Metro Vanpool Program Application and Agreement forms a one to one relationship between Metro and the enrolled Volunteer Participant. Given our one to one relationship with the Volunteer Participant, Metro will always contact the Volunteer Participant first. While we understand you have relationship with the Volunteer Participant, the one to one relationship we have them allows this taxpayer-funded program to continue. The best way an employer can help Volunteer Participants maintain a successful vanpool is to empower them with the information Metro needs. Make sure that the Volunteer Participants at your worksite understand that they are solely responsible for all reports and requests from the Metro Vanpool Program. In attempt to collect required documents, Metro may provide updates to employer representatives so they can inform or assist Volunteer Participants with their missing documentation. When timelines are critical and report details are missing or incorrect, Metro may email the employer representative letting them know we are missing information. The employer can contact the Volunteer Participant to encourage or assist them in the completion of the details required. Metro may contact the employer representatives to assist with the collection of the following items. Contact the Metro Vanpool Program Marketing Representative at 213.922.6226 to let us know you would like to receive notices of outstanding items. Vanpool commuting can help your company’s bottom line by reducing parking demand and improving your ability to recruit and retain qualified employees. The cost of parking is predominantly borne by businesses. Whether you pay for off-site employee parking or offer free parking, parking shortages can limit company growth potential, diminish land use options, use up customer parking and add maintenance costs. Parking costs are one of the most immediate cost areas that companies can relieve through encouraging employees to vanpooling. The average one-way commute distance for an employee is nearly 20 miles. Longer commutes impact employment choices and retention. Offering a vanpool program enhances your company’s overall benefits package by easing burdensome commutes. And participating in the Metro Vanpool Program reduces these commute costs even further. Whether you are converting existing employee vanpool groups, or registering new vanpools, the Metro Vanpool Program can help. Both employers and employees can benefit by participating in Commuter Benefits, a program outlined in the federal tax code that offers employer tax breaks for subsidizing vanpools for employees. In addition, employees may benefit when they set aside pre-tax dollars for vanpool commuting expenses. Participating vanpool leasing agencies accept TransitChek vouchers which can make providing vanpool subsidies to employees easier. Employer sponsored subsidies can lower vanpool fares even more. Employer sponsored Guaranteed Ride Home Programs can supplement the employer’s offerings. Contact the Metro Vanpool Program Marketing Representative at 213.922.6226 for more information about the benefits of the Metro Vanpool Program. Who is a Volunteer Participant? Who are passengers? The Volunteer Participant is the primary driver or lease holder with whom Metro has executed a Metro Vanpool Program Participation Agreement to operate a vanpool in public service. Metro maintains a one to one relationship with the Volunteer Participant. Passengers are the people that ride in the vanpool. Passengers may or may not be alternative drivers. Volunteer Participants are required to maintain their list of passengers with Metro. What are the most important tips I can pass along to Volunteer Participants? One, empower your enrolled Volunteer Participants with the tools and information they need to interact with Metro. Two, encourage enrolled Volunteer Participants to visit the Participating Vanpools page to learn more about the Metro Vanpool Program. Three, instruct Volunteer Participants to read communications from Metro carefully. The number one reason Volunteer Participant Agreements are terminated is failure to read and act on Metro communications. What happens if I know that a Volunteer Participant is leaving our company? The Volunteer Participant should submit an email with their 1) name, 2) vehicle number, and 3) last day of Normal Commute Service* to Metro at vanpool@metro.net. Please review our Agreement Termination Policy. Volunteer Participants should contact their Vehicle Supplier too. If someone else will assume responsibility for the vanpool, please visit our Volunteer Participant Switch FAQ. The Help Desk is available to provide specifics for the final Vanpool Monthly Report timeline and the process to transition the vanpool to another individual if needed. Metro Vanpool Program Help Desk can be reached at 213.922.7003 or vanpool@metro.net. * Normal Commute Service Day: A day when a vanpool operates in both directions (to and from work) in commute service along its scheduled route, at its scheduled times, with more than one passenger. Can anyone on the vanpool sign the Monthly Vanpool Report? Acknowledgement shall be signed and dated by the Volunteer Participant. The signature must be hand signed by the Volunteer Participant only. Anyone can record daily trip information, prepare the Monthly Vanpool Report, or submit reports on behalf of the Volunteer Participant. However, only the Volunteer Participant is authorized to sign the Monthly Vanpool Report. Check your Vanpool start date to be sure you send your Vanpool Report in at the appropriate time. For example, if your enrollment date is July 1, your first report will be due by the third business day in August. If someone else was responsible for your vanpool prior to your enrollment date, that Volunteer Participant will need to submit any Monthly Vanpool Report due up through and including their termination date. See our FAQ for more information about Volunteer Participant switches. One of the vanpools at our organization got an Occupancy warning letter? When a vanpool does not meet the minimum 55% occupancy requirement in a calendar quarter, Metro will send a warning letter to the Volunteer Participant’s address on file. The letter explains that the vanpool did not meet the minimum requirement for the evaluation quarter. The vanpool has an additional calendar quarter to meet the minimum 55% occupancy standard. Metro provides on-line resources to help assist the vanpoolers in finding additional riders along with a Riders Wanted flyer. Employers can be one of the best resources during this process by utilizing databases to identify individuals that may live nearby and introduce the employees to each other. Employer intranet posting as well as flyers and emails can be an effective communication tools as well. Please review our complete Occupancy Policy for more information. Can I call in to verify receipt of the Monthly Vanpool Report? Metro maintains a one to one relationship with the Volunteer Participant. Employers may provide assistance to send the report, but Metro will always communicate with the Volunteer Participant. When timelines are critical and report details are missing or incorrect an email may be sent to an employer representative to inform the Volunteer Participant that they should contact the Metro Vanpool Program and/or complete and send the required document. The employer may contact the Volunteer Participant to encourage or assist them in the completion of the required details. Why can’t we complete the Metro Vanpool Program Application on behalf of our employee? 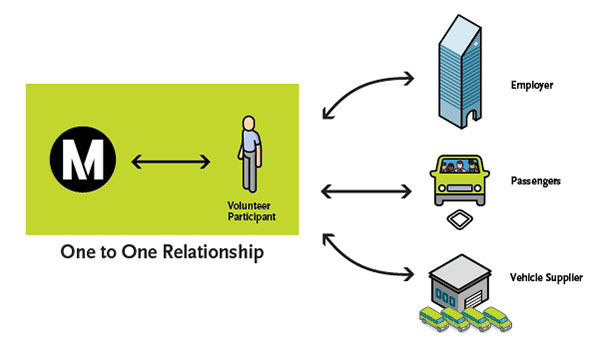 Metro Vanpool Program Agreement and Application establishes the one to one relationship Metro and the Volunteer Participant. The Agreement Terms and Conditions state that participation is not acting on behalf of official company business nor does the agreement establish an employer-employee or agency relationship with Metro. To ensure that Metro is receiving accurate information, the Volunteer Participant should complete all Metro Vanpool Program documents. The application process can serve a learning experience for Volunteer Participants. Those who successfully complete the application process on their own have a greater understanding of how to interact with Metro. I got a notice that one of the Vanpools did not submit a Monthly Vanpool Report. What should I do? Contact the Volunteer Participant and inform them that Metro is missing the report or critical details within the report. It is important to take action as soon as possible in effort to meet deadlines that may affect the vanpool subsidy. Metro staff contacts the Volunteer Participant prior to employers receiving missing/unacceptable report notifications. Encourage your employees to read communications from Metro carefully. The number one reason Volunteer Participant Agreements are terminated is failure to read and act on Metro communications. As an employer you may reach out to the Metro Vanpool Program’s Employer Coordinator at 213.922.6226. Should an Applicant or enrolled Volunteer Participant have questions, please direct them to contact the Metro Vanpool Program Help Desk at vanpool@metro.net or 213.922.7003. We will be happy to help. These are the definitions of the terms used in this document. The primary driver or lease holder with whom Metro has executed a Metro Vanpool Program Participation Agreement to operate a vanpool in public service. The organization that rents or leases vanpool vehicles to qualified Volunteer Participants providing vehicle repair, maintenance, insurance, and lease fare collection. A day when a vanpool operates in both directions (to and from work) in commute service along its scheduled route, at its scheduled times, with more than one passenger.